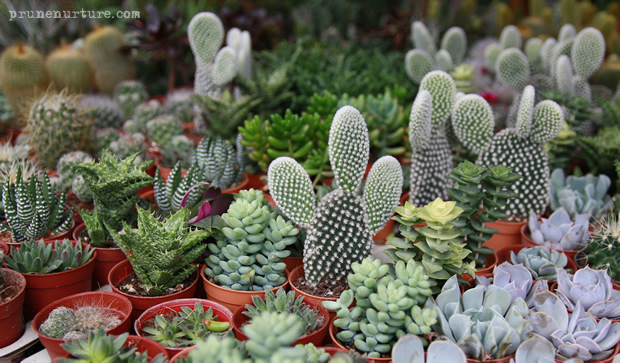 We were away for a short 4D3N (4 days 3 nights) holiday at Cameron Highlands with our friends and Dot’s favourite friend. All of us were looking forward to this long awaited trip, especially the children. 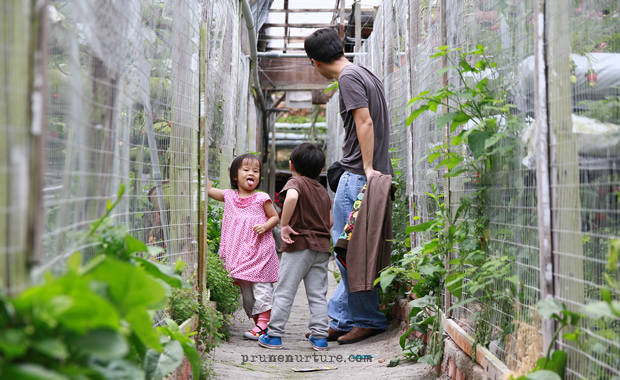 We went to the Market Square at Kea farm, Sungei Palas BOH tea plantation, the mossy forest, Butterfly Garden, agrofarm tour and the must-visit Time Tunnel museum. It was a good decision to travel during off-peak season as there was definitely no crowd, minimum waiting and it was cheaper too as there was no peak surcharge. When Dot and I were at the Malaysian customs, I brought her to the toilet. It was late at night and there were only two of us in the toilet. She asked and answered her own question, “Mommy, why there are only two of us? God will protect us. Jesus also.” Indeed, God was watching over us throughout our trip. It was 10-hour night coach from Golden Mile to Cameron Highlands with breaks in between. Thank God, our children slept through the night, though I could barely sleep in the moving and noisy bus. We reached Equatorial hotel at about 8am. 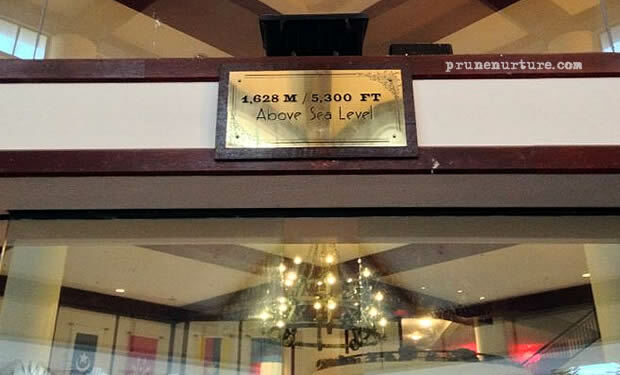 Our hotel is situated 1628m above sea level. The game stations at the hotel lobby kept them entertained, while the daddies checked with the reception whether we could check-in early. Thank God, we could check-in early into our rooms and the best thing was we could upgraded to a Deluxe room from a Superior room. The Deluxe room was clean and newly renovated. We washed-up and rested a little before we went out for a walk. As we walked, we observed the beautiful flowers outside our hotel and picked several pine cones from the ground. 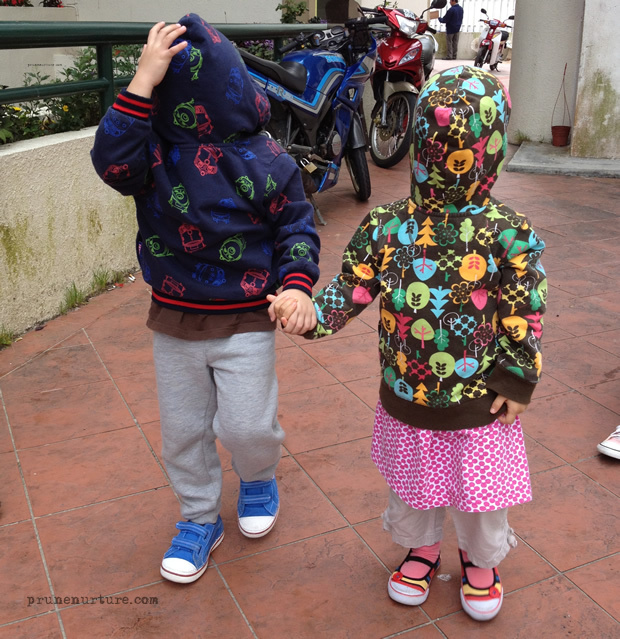 The children decided that they wanted to wear their jackets with their hoods the other way round and hid their faces with the hoods. Of course, we were on standby, just in case. They walked for a while and then somehow got into a little “fight”. It took us probably about 20-30 minutes before we reached EQ strawberry farm, which was just 10 minutes walk from our hotel, if we went without children. As we need to pay in order to enter the strawberry farm, we just watched the workers picked the strawberries from the outside. We had lunch at local restaurant just beside the strawberry farm. After that, we walked towards Market Square at Kea farm. 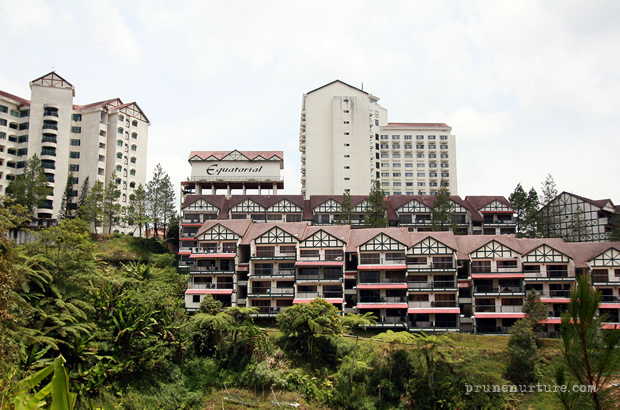 We went down a slope and had a view of Equatorial hotel where we stayed for three nights. 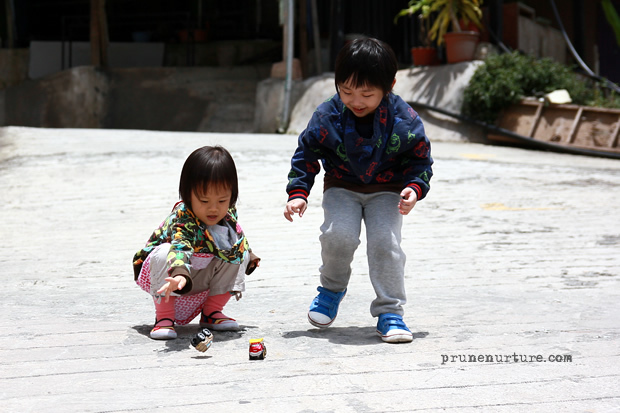 The children, with their little toy cars, started running up the slope and let the little cars ran down the slope. It was such a joy to watch them play. 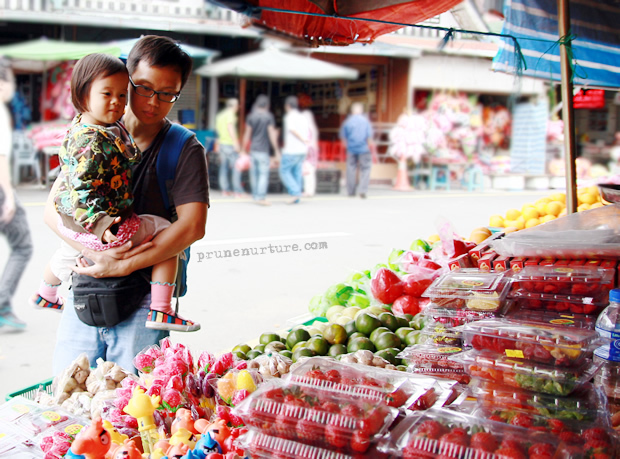 As we walked on, we started to see stores selling souvenirs, fresh fruits and vegetables. We bought a bagful of corns, which we later learnt that they were not grown in Cameron Highlands but Ipoh. 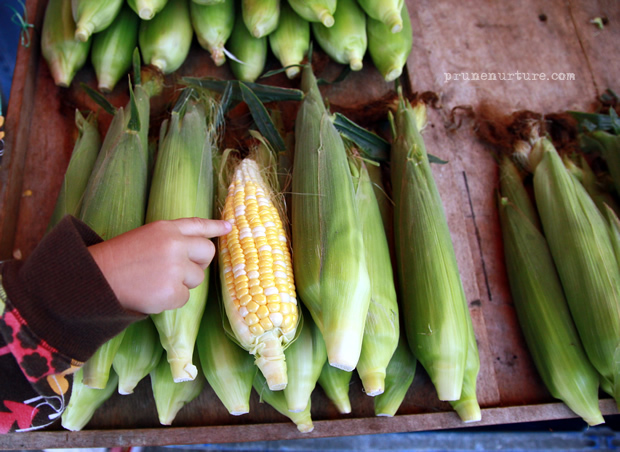 According to a tour guide we met on our last day, the “real” corns from Cameron Highlands are much bigger, sweeter and juicer. Strawberries are everywhere. 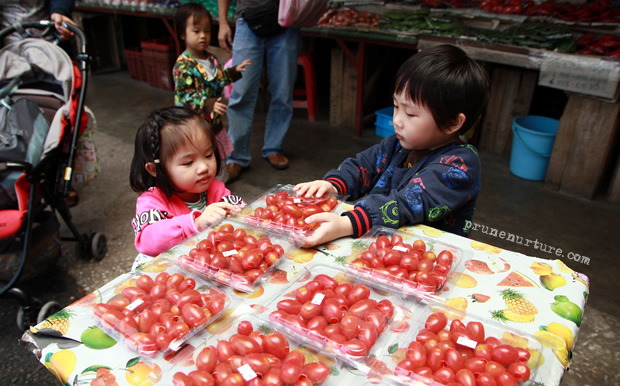 Strawberry is the signature fresh produce of Cameron Highlands. 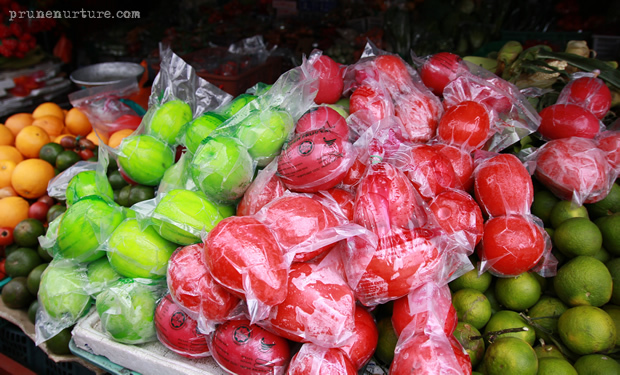 These bright green and red fruits caught my eyes. Anyone know what fruits are these? After the Market Square visit, all of us went back to our hotel rooms and took our much needed afternoon nap. When we woke up, it was almost dinner time. The sky was still bright when we walked along the road towards Market Square. We had our dinner at a cafe that serves western food. In the late evening, the sky turned almost pitch dark except for a few dim lights along the road. As there was nothing much to do after our dinner, we decided to walk back to our hotel. The road is not very well-lit. Thank God, we had a torch in our bag, which came in handy. It lighted the path ahead for us and also to signal to the drivers that we were there. We reached our hotel safely and we sat at the lobby to chat while the children ran about and played at the game stations.